Most of us will only ever see a lion or a zebra or an elephant in a zoo. Today I saw them on the TV. I watched a news story about the Serengeti and how the government wants to build a highway through it to make money off of the battery industry. You see there are minerals in Lake Victoria that China wants to purchase for battery (hybrids and cellphones) production. So what is the big deal? It is just a road right? Actually it will be a high speed highway (in red in picture) that will cut through migratory paths of the wildebeest and will also allow easy access for poachers. The trucks could also introduce non native species to the area. The government plans to go ahead with building the highway and has already started to put markers down. There is another option though. 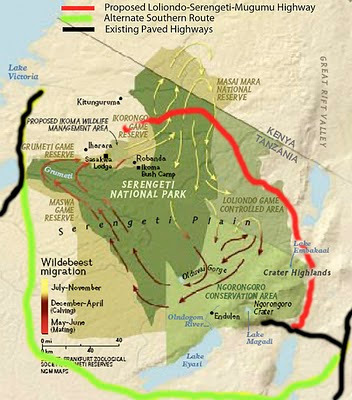 They could build a road that runs to the south (in green in picture) and does not cut through the Serengeti. But this option will take the trucks longer to get the minerals from Lake Victoria and the government fells that this could cost them profits. At one point do we as a global community have the right to step in and question what the Tanzanian government about the decisions they are making? We have made similar decisions in our own countries. Canada allowed the Diavik diamond mine to be built in the migratory path of the caribou. But at least there was an environmental impact assessment completed and steps were taken to minimize the impact of the mines operations on the caribou. The Tanzanian government does not seem interested in looking into alternatives. What will it cost them? Tourism dollars and the beauty that defines the natural environment of their country. Problem is you can't really put a price on the latter. What's all the Buzzzz about?